Finding a great hat for summer is not that hard. There are so many different styles and colours to choose from it’s pretty easy to find one that you love. The main problem though is trying to find the perfect outfit to compliment the hat perfectly. There are so many great ways to wear a hat but when the time comes to choose an outfit it never seems to be quite right. Below we will go over a few different ideas for outfits that go perfectly with hats for summer. If you are someone who likes a real classic look, try pairing a white panama hat with a beige button up and shorts, or even a beige dress. This classic pairing is something that will never go out of style because of its neutral palette. Another great way to style panama hats for summer is by sticking to classic outfits like a button down shirt and skinny jeans. It really doesn’t get much easier than that. Maybe you are someone who likes to try more daring looks, if do, you can easily pair fedora hats for summer with a cool printed t-shirt and some denim shorts. You can also throw on a pair of sunglasses for a look that is laid back and cool. A wide brimmed straw hat is no doubt a wardrobe essential, if you want to channel a bit of a vintage vibe. Try pairing it with a high neck, sleeveless blouse or dress with your hair up. This really adds a vintage touch to an updated look. Not only is a wide brimmed straw hat a really ideal hat for the beach, it can also pair remarkably well with a striped t-shirt or a striped flowing dress. It really is a sailor inspired combo that has been around for a very long time, and it’s not hard to see why. Of course, any summer hat looks great on the beach. You can pair it with the swimwear of your choice and maybe a cover up for when you’re not sunbathing or splashing around in the water. If you really want to channel the spirit of summer chic, try pairing the hat of your choice with a sun dress and some aviator sunglasses. This is a look that really looks like summer all while being a little bit edgy. 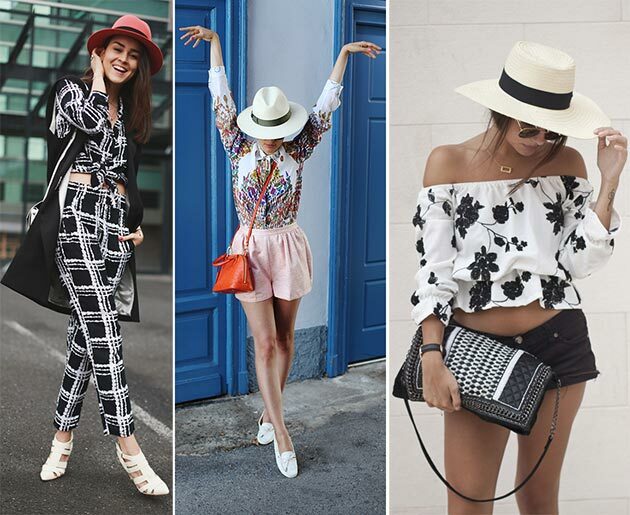 There are so many great ways you can style a hat with your summer wardrobe. When in doubt you should always try sticking to neutral colours and classic outfits that really go well with everything. If you still haven’t found your perfect hat, you can easily search online where you can find a huge variety. The great thing about shopping online is that there is a bigger variety right at your fingertips so you are sure to find the perfect hats for summer to go with all your outfits!